This high level attunement has been brought down to allow a radical transformation of the Soul. It is designed to bring you out of the illusion where you are a limited being and into the true reality where you are an Infinite Divine Being of the Light. This attunement activates the energetic body on the cellular level to initiate DNA recalibration. 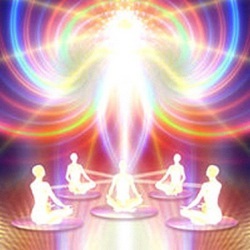 This changes both the energetic and physical body to evolve into a Light Body. This attunement is for those who wish to discover their Divine path, their Spiritual mission and begin to incorporate their higher energies into this physical space – to live as a multidimensional being. "I had experienced reiki attunements a few years previously and so thought that I would experience a similar feeling. This is so much more than an attunement. Savitri's gifts shine through in these Divine attunements. I felt wrapped in calm and colourful arrays of energy throughout my body and left feeling happy, relaxed and light. Since the atunements I have been much more sensitive to my own and others emotions, a much greater sense of direction in my life, a calmness and have been told that I have a 'glow' about me. I have and will recommend this experience to others."